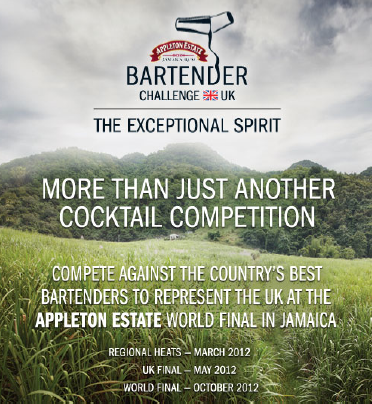 The Appleton Estate Bartender Challenge returns this January calling all bartenders, for the chance to be crowned UK finalist before being flown all expenses paid to Jamaica to represent the United Kingdom in the world final in October 2012. The Appleton Estate Bartender Challenge will be the ultimate test of skill and ability of the best bartenders across the UK using the full range of Appleton Estate’s hand blended golden rums, from the Appleton Estate V/X through to the Appleton Estate 21 Year Old, all with the distinctive aroma of rich Caribbean spice – the hallmark of all Appleton Estate Jamaica rums. To qualify for the regional heats (the Bristol one takes place on March 5), simply upload your entry on the Appleton Estate Bartender Challenge Facebook Page before the closing date of Tuesday 7 February. Regional heats will take place throughout February and March across the UK, where 12 bartenders will go head to head in each region for their chance to make it through to the London final. Bartenders will be judged on a range of real life scenarios from technical bartending skills and knowledge to their charisma, creativity, personality and ability to entertain and charm the customer. Judges will include Jamie MacDonald, partner of award winning bar The Raconteur and newly opened Crown & Felon and Appleton Estate Master Blender Joy Spence.